Best solution will keep DOM tree since it allows more effective debugging and application state monitoring using Dev Tools. Our research on “slow DOM problem” took theses listed above as an input. After two years of experiments we got HTML GL – library which allows to render HTML/CSS content in WebGL. It is easy to use, framework agnostic and does not require developer to study new concepts or technologies keeping him in common HTML/CSS/JS world. How to use HTML GL? Include htmlgl.js into your project. Use tag name <html-gl> for elements you are going to animate. 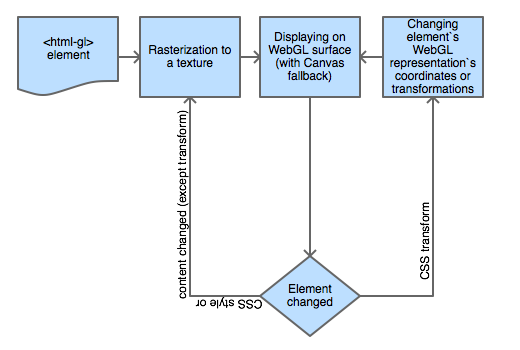 These elements will be rendered in WebGL and their CSS Transform property will be a facade for WebGL representation transformations. The DOM element itself will not be displayed or animated. All transforms happens on GPU and affect only WebGL textures representing element. This decreases resources consuming and allows better control over resources usage. What differentiate HTML GL from React-canvas or similar is that it keeps hidden but still actual DOM structure and is easier to debug. 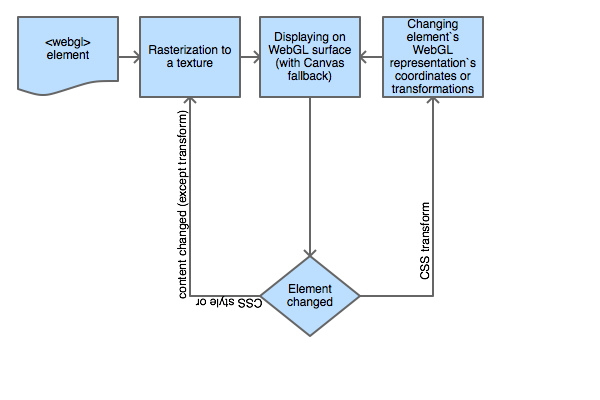 Main idea behind HTML GL is controllable HTML/CSS rasterization and uploading it to GPU as a texture. It is similar to hardware accelerated CSS, but have direct output to the screen and we have more control over. As you see the flow allows to mix classic DOM content and HTML GL in one application. HTML GL do not limit user in choosing a framework, do not force to study specific APIs. Just add <html-gl> to tweak performance and be able to add amazing effects. Of course it is not literally dead, but saying “better WebKit will save humanity” sounds a bit weird since more and more projects move to Chromium and Blink right now. WebKit need a good kick to take the lead again. Why don’t you use distance fields to render fonts? Wouldn’t that solve your “blurry” problem?